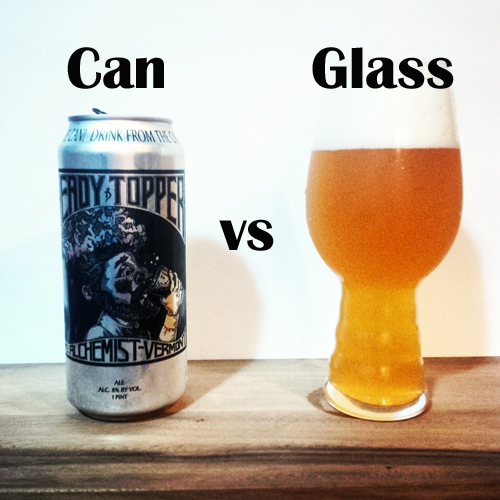 Heady Topper – Can vs Glass: So you’ve managed to get your first Heady Topper and like most of us who got their first one, you are baffled by the instructions that say “Drink From The Can!”. How could this be? Everything you’ve ever been taught in beer school says for the best experience pour your beer into a glass. In fact, even better pour it into a specialty IPA glass designed by Speigelau, Dogfish Head and Sierra Nevada or something called a tulip glass. 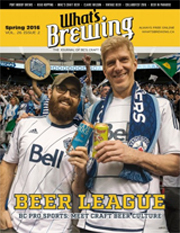 Odds are you’ve verbally shunned someone drinking beer straight from the bottle at some point, or you’ve scoffed at someone drinking an ale from a can – perhaps silently this time due to the size of their pectorals. You’ve been taught to enjoy all beers from a drinking vessel other than the one it came in, so you find you self pondering: how could the makers of one the most sought after beers in the world commit such beer blasphemy by telling you to drink it straight from the can? The truth is I believe that at The Alchemist they know something you don’t, and I had to test this to find out exactly what the difference is and perhaps why you should try your first one from the can as instructed! Side by Side Comparison Test: Now, I had my first Heady Topper about 6 months ago and I figured that would likely be my last one for a while since I am a west coaster and one does not simply get Heady Topper out here, or anywhere outside Vermont for that matter. However, recent circumstances allowed me to come into possession of a couple 4 packs, so I couldn’t resist comparing them side by side from the glass and from the can at the exact same time. In order to do this properly I took both out of the fridge at the same time, from the same 4 pack, drank them at the same temperature and had a palate cleanser to rinse my mouth in between sips. 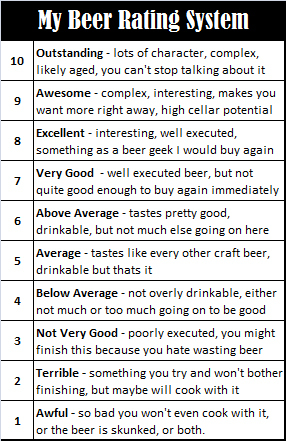 I took tasting and aroma notes on each one and jotted down my overall impression of each version quickly before the alcohol took effect. Yes, I slept well that night by the way and no, I don’t have any more as I already finished or shared them with some beer folks I know who I felt deserved it the most! The Results: It’s really interesting comparing the two at the same time, first off I didn’t notice really any major differences in flavours between the two of them, still there were three exceptions to this. First drinking from the can was slightly metallic (just barely, but I did notice it) so if you are sensitive to that you may want to pour it. Second, there was some noticeable pine resin in the can that was absent from the glass. Third and finally, the malt was more biscuit like in the glass and slightly more caramel and bread like when consumed straight from the can. Those were the only discernible flavour differences, however the two other factors that made a huge difference in my overall impression of the beer were the differences in carbonation and intensity of the beers. I can easily say, with extreme confidence, that straight from the can for this particular beer is my preferred way to consume it. My Theory as To Why: Going back to my beer training, I recall the biggest reason to pour a beer into a glass was to let the flavour open up a bit and actually to bring down the intensity of the bitterness a notch or two to help balance out the beer. Heady doesn’t really need to be balanced out any further as although it is intense, the beer is still fairly balanced in it’s intensity. Heady Topper is said to be made with a particular experience in mind, to deliver a unique adventure in your mouth that isn’t repeatable beyond having another one. Since the carbonation is much more effervescent from the can, this has two distinct effects on the beer. First it makes the liquid spread out all over your palate which hits all of the taste buds on your tongue as wall as the salivary glands on your soft palate, including some minor taste buds that sometimes get missed in lower carbonation beers. Second, the effervescence from the carbonation really lightens the texture of the beer, making it closer to a silky smooth Belgian beer, which often will have an addictive texture – when you pour it into a glass you lose this effect. So What Should You Do: I personally thinks this is one of those scenarios where you should challenge your assumptions and try it from the can. If anything, just to get the intended experience from the brewer you should really try it this way first. 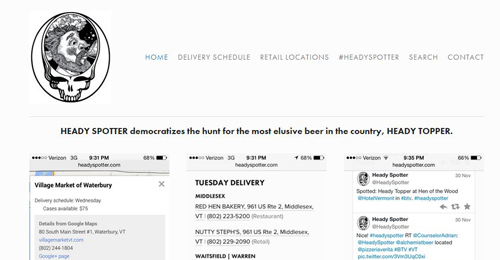 Remember, for the most part, Heady is their main beer and with a few exceptions like Focal Bangerand a couple other small releases, Topper is their main focus at the brewery. The brewers are attempting to create this exact “Wow!” experience and the best way to get is to trust them and try it from the can. But, if you prefer your beers opened up and like them with the lowest possible bitterness, by all means pour it into a glass and enjoy as it’s pretty tasty either way! Here’s the answer as to why to drink it from the can straight from the brewer as well as some other FAQ’s. If I ever manage to aquire two cans of this beer in the future as unlikely as that is then I will try from the can. I really enjoy the one sense you fully left out. The aroma portion of beer is just as important to me. When you are sniffing an aluminum can as you sip you are missing out on a part of the experience. Haha must have been an awkward position.